Rimmel Lash Accelerator Endless Mascara - $8.99 - in black and extreme black - with a unique new micro-fibre formula and lash-catching brush to make lashes instantly appear up to 99% longer. The formula contains a lash growing complex of procapil, keratin and antioxidants to condition each lash day after day, strengthening them and enhancing their natural growth. Over time and with continued use, lashes appear up to 127% longer in just 30 days. 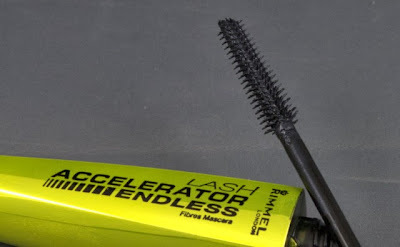 without much in the way of volumizing which is my idea of a perfect mascara! It doesn't offer any sort of curling action so my lashes were a bit flyaway in spots as you can see here, so I would use a curler first next time.